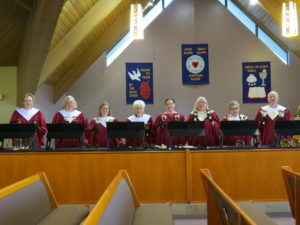 The Chancel Choir sings during the 8:00 am service from September through May. The choir is open to anyone with a love of singing and no musical experience is necessary. Practice time is Wednesdays at 7:00 pm. Handbells are a beautiful form of music played at both the 8:00 am and 10:00 am services, alternately. 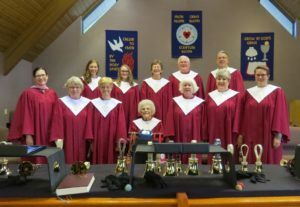 Handbell players are always needed and no prior musical experience is necessary to participate. Practice time is Mondays at 5:00 pm. 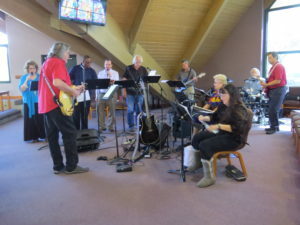 “Joyful Noise” supplies the music for the Contemporary Service at 10:00 am. It is a contemporary musical group using a number of musical instruments and vocals provided by Lisa Bielat, who leads the group. They provide the music and portions of the liturgy and prayer during the service. Practice time is 9:30 am and following the 10:00 am worship. Fountain of Life has an annual Christmas Concert, we feature small ensemble groups formed from the Choir. Also we showcase groups from local campus’s and outside groups that visit the community and perform at the church. If you have any interest in any of our musical groups, please contact Brenda Willer-Buys at bwbuys@follutheran.org or at 520-747-1213. Children’s Chime Choir is an exciting opportunity for beginners, ages K-3rd grade, to learn basic music skills and chime technique. We will meet on Tuesdays from 3:45 to 4:30 pm starting August 14th. An informational meeting will be held on August 7th at 3:35 in Room 9. Contact Brenda Willer Buys at bwbuys@follutheran or 520-747-1213 ext. 107 for more information.